Take ramp marked "Rt. 9N" to ramp marked "Northern Blvd." Make a left at traffic light (Northern Blvd). Property is right past Memorial Hospital. 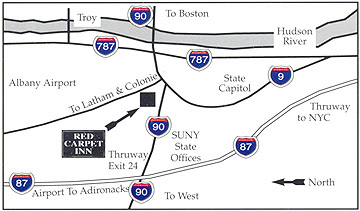 Follow 87 South to exit 5. Make a left on to Rt. 155. At 2nd traffic light, turn right onto Rt. 9S. Follow Rt. 9 through residential area until you see ramp marked "Northern Blvd." Make a raight at end of ramp.